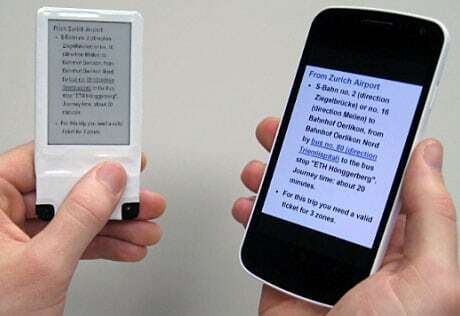 Researchers from Intel Labs, the University of Washington and the University of Massachusetts Amherst have developed an e-ink display that is powered purely by NFC. The low energy, pixel-addressable display does not only receive information from a smartphone via NFC but is also entirely wirelessly powered through what the team calls the NFC Wireless Identification and Sensing Platform, a software defined passive 13.56 MHz RFID tag. Using inductive coupling, the tag harvests the power from an NFC transaction using a special microchip before storing it in a tiny 1mAh battery which can then be used to power the black and white e-ink display as it changes. Compared to a segmented display, a pixel-addressable display requires substantial energy to update, say the researchers. Taiwanese RFID specialist Jogtek has previously demonstrated a batteryless shelf-edge label that uses a segmented e-ink display and NFC, while British Airways is to offer an electronic luggage tag that works on similar principles from next year. That’s a segmented display, which has indeed already been done (for another example, see the Jogtek link at end of story). As I understand it, this team faced extra challenges getting a pixel display working using similar methods. The linked research paper mentions the parts they used. Regardless, this type of solution (from AMS or anyone else) is surely very useful and has a bright future ahead of it.